View More In Hair Perms, Relaxers & Texturizers. 2-step system contains both straightener and neutralizer Shiny, smooth and silky straight hair for up to 2 months Includes Straightener 400g and Neutralizer 400g Shiseido Crystallizing Japanese Hair Straightening is an innovative new technique from Japan to make frizzy, curly or wavy hair completely straight while preserving the hair's health. In the past, people were concerned that if they straightened their hair, they would damage it significantly, and this was true. But it is not true anymore! 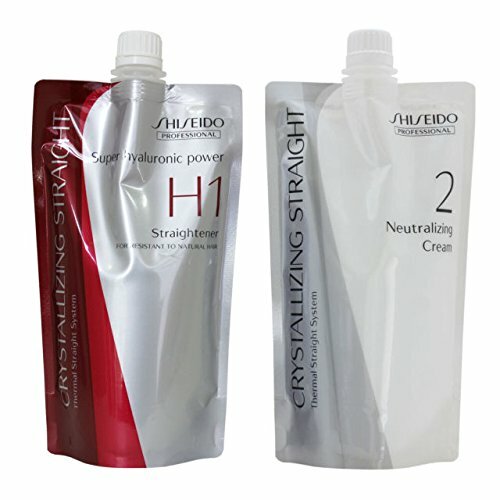 Hair can be straightened much more effectively with the Japanese Shiseido Crystallizing techniques with much less damage to the hair.Suitable for men & women.To make frizzy, curly or wavy hair completely straight while preserving the hair's health This 2 step straight permanent system contains both straightener and neutralizer Permanent solution to be used with a hot hair iron to make your hair smooth, shinny & straight Instructions: Shampoo hair & dry your hair thoroughly. Straightener Apply the cream all over the head of hair, except for the roots, keep it 1 to 2cm above the roots Coat the entire hair evenly & comb straight through with a wide-toothed comb Let it set at room temperature for 10 to 20 minutes Then, after sufficiently plain rinsing, dry the hair thoroughly Set it with a special iron at 180?C / 360?F or less for 2 seconds per location to straighten the hair When applying Straightener, keep it 1 to 2 cm above the roots, as getting it on the scalp could cause irritation & hair for breakage.Use an intermediate water rinse to completely wash away straightener. Especially wash the roots carefully Neutralizer Coat the entire hair & leave it for 2 to 3 minutes while lightly combing. Then, completely wash it awayIf the neutralization is not complete, it could cause damage or hair for breakage, so coat the hair sufficiently from the roots to the tip of the hair to make sure neutralization is complete.Productof Japan. Shiseido Crystallizing Straight is an innovative new technique developed by Shiseido Professional in Japan to make frizzy, curly or wavy hair to be completely straight while preserving the health of hair. Typically improves hair's feel, softness and shine while making it more manageable. If you have any questions about this product by Shiesido, contact us by completing and submitting the form below. If you are looking for a specif part number, please include it with your message.